Read about The Secret's news, history and recipes. 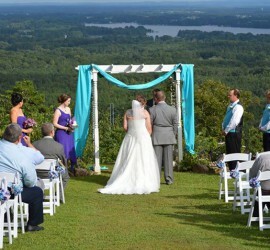 Our view makes an amazing back drop for your ceremony. View the lodge as well as the natural beauty surrounding The Secret. 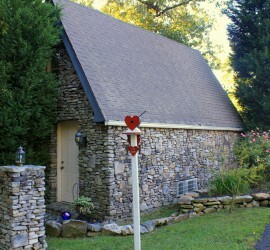 Perched atop Lookout Mountain lies The Secret Bed and Breakfast Lodge – the best kept secret in the south! 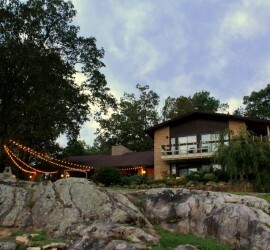 The Secret Bed and Breakfast in Alabama offers spectacular views by day and enchanting views by night! Spectacular and breathtaking only begin to describe the more than 180 degree panoramic view of the foothills, valleys, and beautiful Weiss Lake below. Set atop the Lookout Mountain ridge with gothic rock formations one can see Rome, Georgia to the east and Weisner Mountain in Piedmont, Alabama to the south. Spreading majestically behind Weisner Mountain, lies the Cheaha Mountain range. Mount Cheaha, the highest point in Alabama, looks like a silver-wrapped candy kiss atop the mountain range. To the west the town of Gadsden, Alabama sparkles brilliantly when darkness falls. The view is as spectacular by day as it is enchanting at night. The Secret Bed and Breakfast is the perfect setting for making dreams come true or celebrating special moments or anniversaries. We have four unique guest cottages along with guest rooms in the main lodge. Our views provide amazing backgrounds for weddings and the lodge offers plenty of space for family reunions and business retreats. View breathtaking scenery from around the bed and breakfast property.